PARANOIA was a group exhibition about the proximity of art and life against the backdrop of contemporary politics exploring issues of distrust, suspicion, delusion, fear and terror. PARANOIA presented works of international artists exploring the essence of paranoia as one’s deluded interpretation of events, not the perception of the events themselves. Emilia Telese performed a different piece of work at each venue. LAUNCH: Leeds City Arts Gallery, Leeds, 28th June 2006. TOURING: Focal Point Gallery, Southend, Oct/Nov 2006. Our image-obsessed society constantly bombards us with enhanced, airbrushed photographs of perfect women. It is increasingly difficult to perceive and accept one’s own appearance as ‘attractive’ or even ‘normal’. EMILIA PARANOICA – PERFECT 10: is a live art performance and installation dealing with image obsession and the concept of the ‘fitting in’ by trying to achieve the unattainable and narrow ideals of beauty perpetrated by contemporary media. Women and girls worldwide are incessantly bombarded with images of digitally enhanced, unrealistic female beauty based on an idealized version of Western-type body and face. This fuels a multi-billion dollar industry based on insecurity about looks and a homogenized model of appearance that doesn’t take into account the individual, diverse reality of how women look in different cultures, at different ages and times of their life. Paranoia is created, to the point that teenage girls trade wrinkle creams with their mothers and women under 25 seek plastic surgery to ‘fit in’ with unrealistic expectations. An obsession with eternal youth contrasting with a globally ageing population. Beyond Stereotypes: Rebuilding the Foundation of Beauty Beliefs? Dove Global Study commissioned by Dove, a Unilever Beauty Brand) http://www.campaignforrealbeauty.com tells us that 90% of all women 15-64 worldwide want to change at least one aspect of their physical appearance and 67% of them withdraw from life-engaging activities due to feeling badly about their looks (among them things like giving an opinion, going to school, going to the doctor). EMILIA PARANOICA – PERFECT 10 took place in the Ziff Gallery at the Leeds City Art Gallery, where a series of paintings and sculptures depicting beauty ideals are kept, including Antonio Canova’s ‘Hope of Venus’. 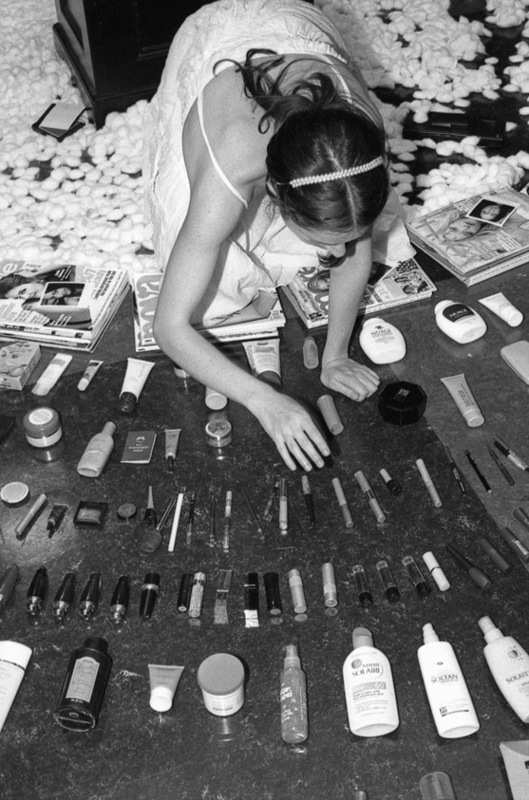 The piece starts with a four hours live performance in which the artist is surrounded by her own collection of cosmetics and toiletries hoarded throughout her life. Using the latest beauty products, obsessively advertised in glossy magazines, Emilia Telese tries to replicate the looks of the perfect models depicted on them. The rituals of cleansing, toning, moisturising and applying make up is followed scrupulously to try and achieve an unachievable perfection. 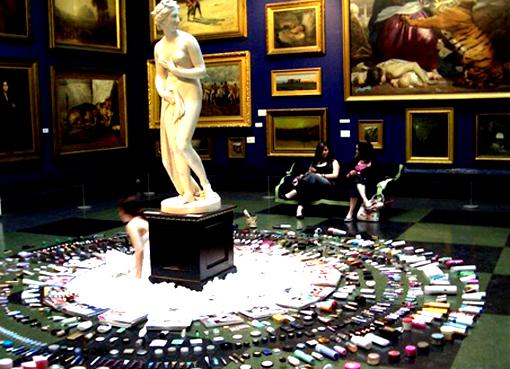 At the end of her performance, Perfect 10 becomes an installation dealing with issues of self-perception and the tyranny of the beauty industry. EMILIA PARANOICA – PERFECT 10 takes its name in part from ‘Emilia Paranoica’ and ‘Morire’, two 1985 punk songs from Italian anarchist band CCCP-Fedeli alla Linea. 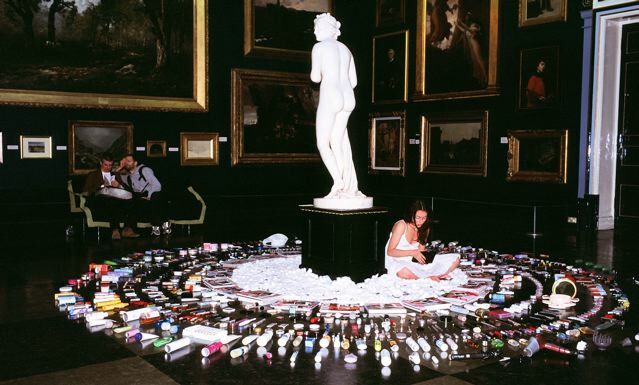 The songs are included in the album Compagni, Cittadini, Fratelli Partigiani, which describes the protest against the appearance-obsessed society of Northern Italy in the hedonistic, consumerist 80?s. ‘Emilia Paranoica’ was also the name with which Emilia Telese was taunted with in her teenage years, for not conforming to the current fashion of the time. Comments about her appearance led the artist to compulsive collecting of beauty products and tools in order to hopelessly perfect her image. Most of these products will be used in the performance. EMILIA PARANOICA – PERFECT 10 – against the paranoia of fake beauty Photography and documentation by Marcus Haydock. Emilia Paranoica: Removed and Destroyed is a site specific performance created for the Paranoia Exhibition at Focal Point Gallery in Southend on Sea exploring issues of paranoia around unattended luggage and the power of knowledge as a weapon of mass reconstruction. Every day, thousands of delays and security alerts on transport systems are sparked off by unattended luggage. Distraction is not tolerated. Trust is eliminated from public services, always assuming the worst. Since the start of the “war on Terror” in 2001 an increasing number of security guidelines have hit plane travellers, that range from the legitimate to the absurd: no fireworks, acid, live plants, but neither food, make up or water are allowed as hand luggage. On train stations and airports continuous alarming messages warn us to never leave anything unattended, as it “will be removed and destroyed without warning”. 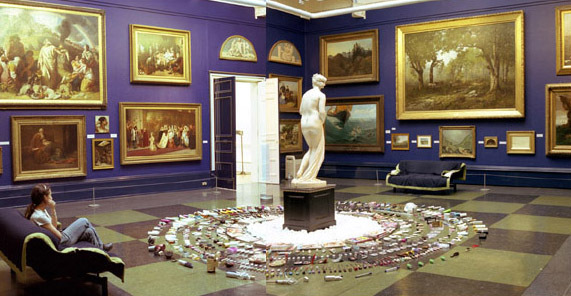 In many public buildings, including museums, galleries and libraries, bags are opened and searched unceremoniously by security staff. Alarms bleep. A hand search is not just for criminals hiding weapons, but it is often performed on anyone guilty of wearing a belt and a bunch of keys. Personal possessions are prodded and privacy is impossible. In the eyes of a warfare-oriented state, we are all potential suicide bombers. But is knowledge a more powerful weapon? In many times in history, the burning of libraries and records has heralded times of darkness, fear and ignorance. We now live in a society that allows for knowledge to be accessed and shared like never before. Whilst worrying about a pair of tweezers’ potential to hijack a plane, a single book can hold information that may change the entire fabric of our society. For Emilia Paranoica: Removed and Destroyed, Emilia Telese spent one and a half hours shut in an unattended suitcase at Focal Point Gallery containing items prohibited during flights: corrosives, fireworks, liquids, lipgloss, live bacteria, tweezers, cutlery, catapults, and bleach, whilst reciting text from the 20 books held at Southend Library which result from searching the term “paranoia” in their catalogue. Emilia Paranoica: REMOVED AND DESTROYED is a protest action against the removal of knowledge, freedom of speech and human dignity. THE ENEMY is a performance and installation by Emilia Telese, exploring the idea of religion, superstition and forced dogma using hundreds of rosaries, the symbol of Catholicism, as well as the Neapolitan superstition book, La Smorfia, which turns every dream into a number to play at the lottery, in the study where Sigmund Freud saw the idea of religion as “the enemy”, as well as writing his famous studies on The Interpretation of Dreams and Totem and Taboos. THE ENEMY explores popular Catholic religion in its most superstition-related form, and the journey of self-discovery that leads to the questioning of ideas of Self and God. Most Italian children are “born into Catholicism”, baptized before they are able to understand the concept of God, then as adults go through the stages of Communion, Confirmation, Marriage and Last Rites through a structured form of community living within religious/social movements like Catholic Action League, Communion And Liberation, the Focolarini movement. The Neapolitan’s close link between religion and superstition is particularly visible in the contrast between the rosary, which as a religious symbol with its outmost celebration in the huge Pompeii Sanctuary to the Virgin of the Rosary, is considered the most powerful tool of Catholicism, and La Smorfia, the Neapolitan book which classifies dreams in alphabetical orders and gives them a numerical symbol/meaning to play and win the lottery, and is recited by heart by just the same Neapolitans who recite the rosary every night. As well as his most famous book The Interpretation of Dreams, religion is also something that Sigmund Freud explored extensively during his career and is personified by his collection of artifacts. ARTISTS: Mireille Astore, Franco B, Maja Bajevic, Daniel Baker, Rana Bishara, Lisa K Blatt, Tim Blake, laurie halsey brown, Mircea Cantor, Norman Cowie, Jeremy Deller, Martin Effert, Amy Feigley, Doug Fishbone, Juan del Gado, Sagi Groner, Hatice Guleryuz, Juul Hondius, Avi Mograbi, Ricardo Giraldo Montes, Vesna Milicevic, Hillary Mushkin, Diane Nerwen, Jean-Gabriel Periot, Khaled D. Ramadan, Karst-Janneke Rogaar, Paul Ryan, Jackie Salloum, Larissa Sansour, Nike Savvas, Santiago Sierra, Tatjana Strugar, Doron Solomons, Emilia Telese, Milica Tomic, Akram Zaatari, Katarina Zdjelar, Rachel Wilberforce, Roel Wouters. Catalogue essays: Glenn Bowman, Bernadette Buckley, Elizabeth Cowie, Antonio Pasolini, Khaled D. Ramadan, Ivan Ward and Christel Vesters, with introduction by Predrag Pajdic.